Trash bags and boxes fill Joe's mobile home in a Philadelphia suburb. This isn't spring cleaning. Joe is about to become homeless. Unless "a miracle happens," Joe will likely live in his 2001 Chevrolet Venture minivan by the summer. He removed the seats in the back to make space for a sleeping bag, his laptop and some clothes. Soon to turn 61, Joe never imagined he would be in this position. "When I was a kid growing up...America was the greatest place on planet earth. We were the envy of the civilized world. I never thought this could happen here," Joe says. CNNMoney agreed not to use his last name because he worries potential future employers will Google him. Joe's big fear is that people assume he's lazy. 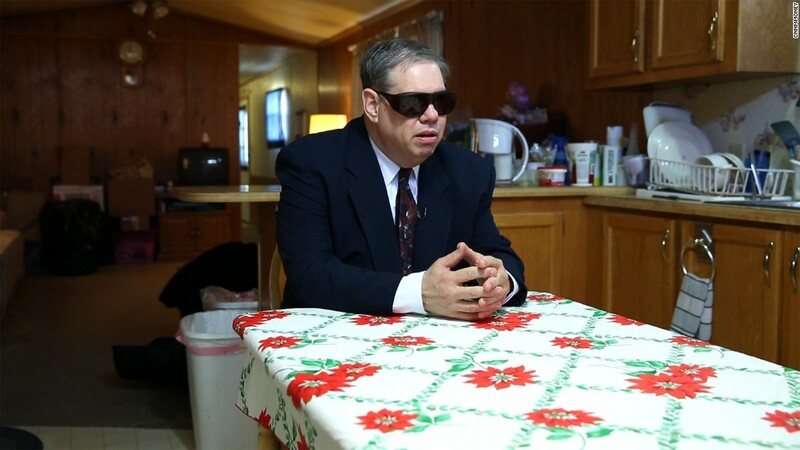 He wore a suit for his interview with CNNMoney and hid his eyes behind big dark glasses because he is ashamed his life has come to this. Joe's worked all his life, starting at age 11 pushing a broom around an uncle's shop. He earned two associate's degrees in electrical engineering technology and mechanical engineering technology and built a "blue collar" career as a technician, tester and machine operator. He loves factories and figuring out how things work. When manufacturing jobs dried up in southeastern Pennsylvania, Joe moved to Minnesota. By the late 1990s, he earned $15 an hour, what he dubs a solid "lower middle class" wage. He figured he would work his way up, get a few raises and maybe buy a home. The American Dream seemed within reach. Then his mother got sick. As the oldest child, he moved back to Pennsylvania in 1999 to care for her. Never married, Joe bought a trailer home with his mother. He managed to get jobs through temp agencies, but the work was never steady. He never earned $15 again. Since being laid off in April 2013 from a manufacturing job, he's worked on and off a total of only seven months. He has drained his savings and retirement accounts and his mother is now in a nursing home, funded by what remains of her life savings and Medicaid. Presidential candidate Donald Trump, a heavy favorite to win Pennsylvania, brings up the plight of people like Joe often in his stump speeches. He recently pointed out that the Keystone state has lost "35% of its manufacturing jobs since 2001." Share your story with CNN: How are you doing financially? Joe is hit by a double-whammy: his age and his blue-collar career. Workers over 50 have been dubbed the "new unemployables." Still hopeful he'll get a job, Joe applies to a few positions a week. His barber acts as his recruiter, asking everyone who comes in the shop if they have heard of openings and will call Joe right away when he gets news. "Yes, I am an older worker, but my life's worth of experience could make me an asset to many places if I could only get the chance to show them," Joe says. The few interviews he's had are short. He feels no one wants to hire "the old guy." Joe's mobile home is paid off, but he owes $483 a month for the lot rent in the mobile home park. He doesn't have the money for May or beyond. Joe is one of 8 million unemployed Americans who remain without work despite a hiring surge in recent years. The hurting economy still exists. 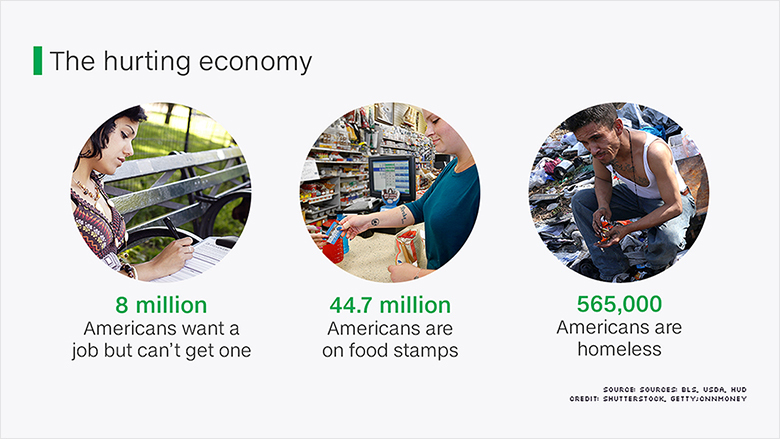 Perhaps the most telling sign that the U.S. isn't back to normal is the 44.7 million Americans on food stamps. Joe is one of them, something else he never envisioned in his life. Before the financial crisis there were only 26.3 million people on food stamps. 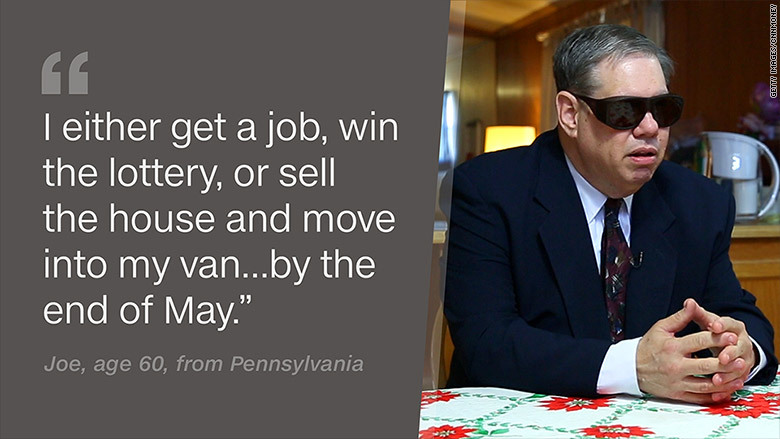 CNNMoney has been in touch with several people who have gone from "getting by" to homeless -- or nearly there. Linda Norris of New Hampshire is in her early 50s. A college graduate, she built a career in the defense contracting field, working her way up to be a senior engineering manager. But between the recession and cuts to the defense budget, she has found herself in short-term jobs. After being laid off again last summer, she has exhausted her savings and had to move in with a friend, becoming effectively homeless. "It's really hard to live on $0 income," says Norris, who spends her time scouring through job openings and applying for at least 10 each day. "I go to resume workshops, job fairs, networking groups. I do all that stuff." Even some younger workers are hurting. A couple in their 40s in Ocala, Florida has been living out of motel rooms and a tent since last summer. "From 2003 to 2008, I had done retail, salon work, and various low-pay customer service type jobs, some being contractual or temping," J.P. told CNNMoney. "I bounced around all over the place in several industries. I just couldn't find anything to stick." J.P. never finished college. She went back to school after the recession because people urged her to earn various Computing Technology Industry Association certifications, know as CompTIAs. Tech jobs were plentiful, they said. "I am now certified, trained and ready to work in a new industry, but that industry has left the building," J.P. says. Despite her certifications, she hasn't been able to get a new job. She blames IT jobs going abroad. A lot of people wonder why the unemployed don't just get a job at a Walmart (WMT) or McDonald's (MCD)? Those on the front lines of helping the poor and homeless say it's not that easy. At the Quakertown Food Pantry not far from where Joe lives, they served 715 families in March. It's down a bit from the peak in 2013. but still uncomfortably high for a region that is growing. "People have found jobs, but not full-time," says Dawn Schaefer, who has volunteered at the pantry for eight years. "There's a epidemic of part-time workers,"
In all her years at the pantry, Schaefer says what has changed most is the increase in the number of people coming who have jobs, but it's just not enough for them to pay rent and eat. "Most of the people we help would love to have a living wage job that they can support their family or themselves," says Donna Berger, another food pantry volunteer. Joe isn't sure if he'll vote in the Pennsylvania primary on Tuesday. He says America "took a wrong turn many, many years ago." He's not sure if anyone can get it back on track. If he could do it all over again, he would go back and learn more of a trade like auto repair or plumbing. "Even Donald Trump has to write a check to his plumber," he says. Editor's note: Many CNN readers have asked about ways to help Joe. One reader has started a GoFundMe for him. People may also contact reporter Heather Long at heather.long@cnn.com to connect with Joe's landlord or pass along job opportunities.